Like other businesses, Boat Trader needs to keep track of its inventory. At press time in early January there were 138,303 new and used boats listed for sale at BoatTrader.com, roughly half new and half used. During the 12-month period from Oct. 1, 2011, to Sept. 30, 2012, there were 162,789 boats at the site. Boats for sale are listed by dealers, brokers, builders and private sellers. On a national basis the majority fall in the range of 15 to 24 feet, with the largest group, 30.5 percent, in the 20- to 24-foot range. 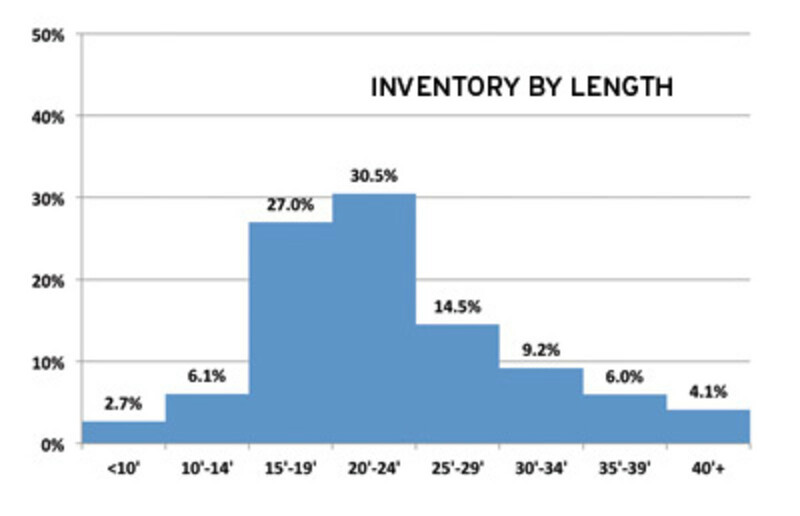 With another 8.8 percent of listings shorter than 15 feet, it seems reasonable to project that about two-thirds of the boats listed for sale are trailerable. Yet there also are plenty of larger boats at the site; nearly 34 percent of the listings are for boats longer than 25 feet. More than 50 percent of the boats are listed for $30,000 or less, with the largest number (14 percent) in the range of $10,000 to $15,000. The median asking price is $20,000 to $25,000. At the upper end, 10 percent of the boats are listed at $90,000 and up.